, a younger brother of a good family, either of Broughton, or of Flixborough in Lincolnshire, descended originally from Scotland. He received the first part of his education in the country, and went afterwards to Lincoln college in Oxford: from thence he removed to the Inner Temple, where he read law with great assiduity, and in due time was called to the bar. In the ninth of queen Elizabeth, he was both Lent and Summer reader; in the sixteenth of that queen, double reader, notes of which readings are yet extant in manuscript; and in the nineteenth year of queen Elizabeth, he was appointed one of the queen’s Serjeants at law. Some time after, he was made a judge; and, in 1581, being upon the Norfolk circuit at Bury, he exerted himself against the famous Browne, the author of those opinions which were afterwards maintained by a sect called from him Brownists: for this conduct of judge Anderson, the bishop of Norwich wrote a letter to treasurer Burleigh, desiring the judge might receive the queen’s thanks. In 1582, he was made lord chief justice of the common pleas, and the year following received the honour of knighthood. In 1586, he was appointed one of the commissioners for trying Mary queen of Scots; on the 12th of October, the same year, he sat in judgment upon her; and on the 25th of the same month, he sat again in the star-chamber, when sentence was pronounced against this unhappy queen. In 1587, he sat in the star-chamber on secretary Davison, who was charged with issuing the warrant for the execution of the queen of Scots, contrary to queen Elizabeth’s command, and without her knowledge. After the cause had been heard, sir Roger Manwood, chief baron of the exchequer, gave his opinion first, wherein he extolled the queen’s clemency, which he said, Davison had inconsiderately prevented; and therefore he was for fining him ten thousand pounds, and imprisonment during the queen’s | pleasure. Chief justice Anderson spoke next, and said that Davison, had done justum, non juste,—that is, he had done what was right, but not in a right manner, which, Granger observes, is excellent logic for finding an innocent man guilty. 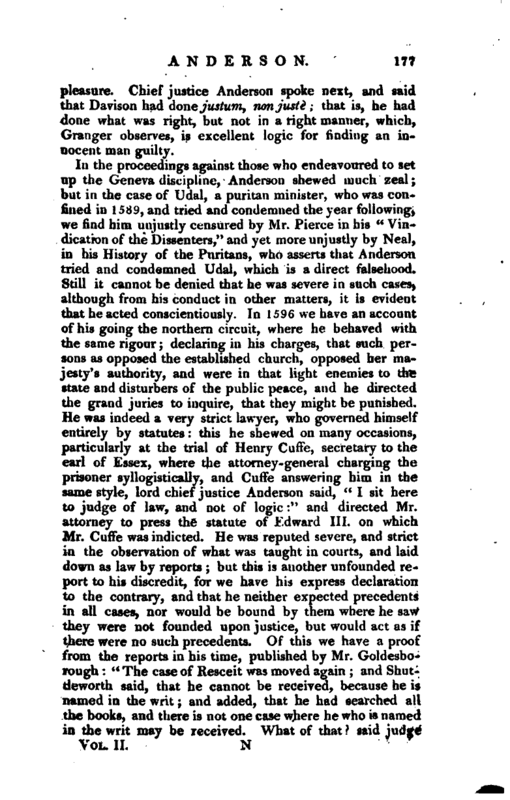 In the proceedings against those who endeavoured to set up the Geneva discipline, Anderson shewed much zeal: but in the case of Udal, a puritan minister, who was confined in 1589, and tried and condemned the year following, we find him unjustly censured by Mr. Pierce in his “Indication of the Dissenters,” and yet more unjustly by Neal, in his History of the Puritans, who asserts that Anderson tried and condemned Udal, which is a direct falsehood. Still it cannot be denied that he was severe in suoh cases, although from his conduct in other matters, it is evident that he acted conscientiously. In 1596 we have an account of his going the northern circuit, where he behaved with the same rigour; declaring in his charges, that such persons as opposed the established church, opposed her majesty’s authority, and were in that light enemies to the state and disturbers of the public peace, and he directed the grand juries to inquire, that they might be punished. 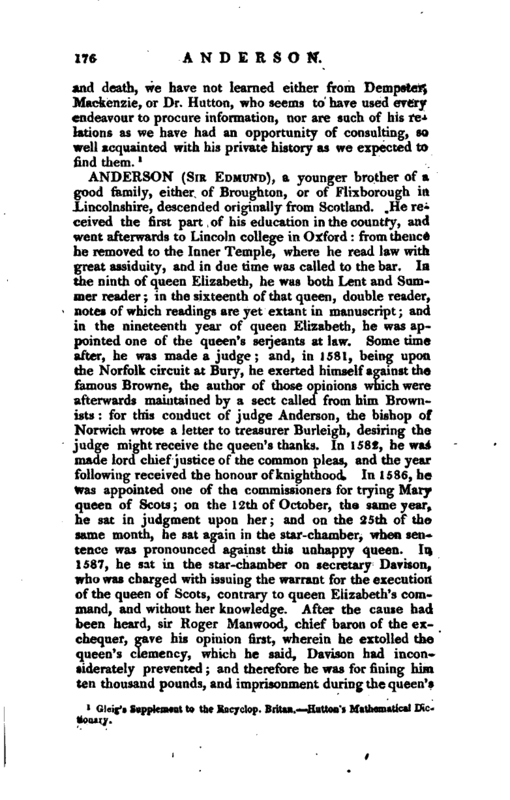 He was indeed a very strict lawyer, who governed himself entirely by statutes: this he shewed on many occasions, particularly at the trial of Henry Cuffe, secretary to the earl of Essex, where the attorney-general charging the prisoner syllogistically, and Cuffe answering him in the same style, lord chief justice Anderson said, “I sit here to judge of law, and not of logic:” and directed Mr. attorney to press the statute of Edward III. on which Mr. Cuffe was indicted. He was reputed severe, and strict in the observation of what was taught in courts, and laid down as law by reports; but this is another unfounded report to his discredit, for we have his express declaration to the contrary, and that he neither expected precedents in all cases, nor would be bound by them where he saw they were not founded upon justice, but would act as if there were no such precedents. 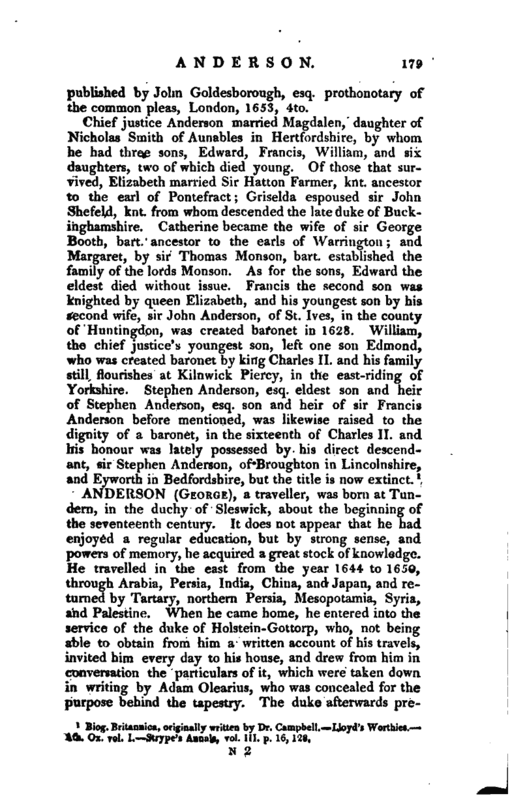 Of this we have a proof from the reports in his time, published by Mr. Goldesborough: “The case of Resceit was moved again; and Shuttleworth said, that he cannot be received, because he is named in the writ; and added, that he had searched all the books, and there is not one case where he who is named in the writ may be received. What of that? said | Anderson; shall we not give judgment, because it is not adjudged in the books before? we, will give judgment according to reason; and if there be no reason in the books, I will not regard them.” His steadiness was so great, that he would not be driven from what he thought right, by any authority whatever. This appeared in the case of davendish, a creature of the earl of Leicester; who had procured, by his interest, the queen’s letters patent for making out writs of supersedeas upon exigents in the court of common pleas, aiyd a message was sent to the judges to admit him to that office: with which, as they conceived the queen had no right to grant any such patent, they did not comply. Upon this, Mr. Cavendish, by the assistance of his patron, obtained a letter from the queen to quicken them, but which did not produce what was ex pected from it. The courtier again pursued his point, and obtained another letter under the queen’s signet and sign manual; which letter was delivered in presence of the lord chancellor and the earl of Leicester, in the beginning of Easter term. The judges desired time to consider it, and then answered, that they could not comply with the letter, because it was inconsistent with their duty and their oaths of office. 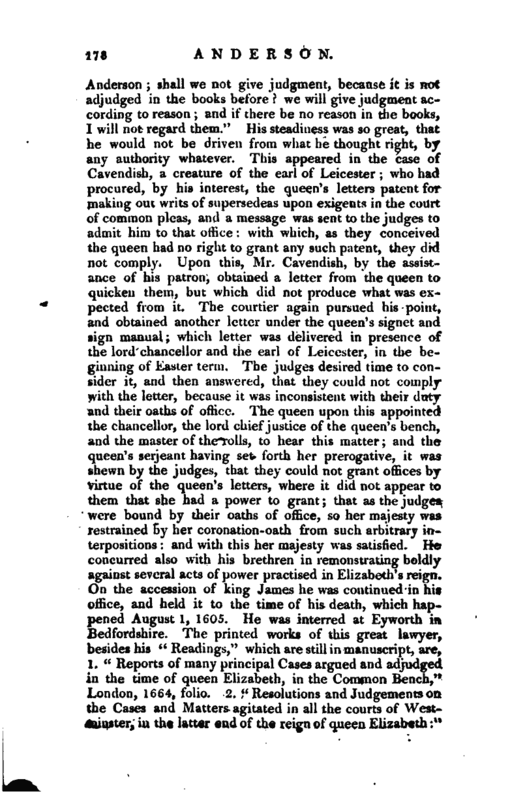 The queen upon this appointed the chancellor, the lord chief justice of the queen’s bench, and the master of the rolls, to hear this matter; and the queen’s serjeant having set forth her prerogative, it was shewn by the judges, that they could not grant offices by virtue of the queen’s letters, where it did not appear to them that she had a power to grant; that as the judges were bound by their oaths of office, so her majesty was restrained by her coronation-oath from such arbitrary interpositions: and with this her majesty was satisfied. He concurred also with his brethren in remonstrating boldly against several acts of power practised in Elizabeth’s reign. On the accession of king James he was continued in his office, and held it to the time of his death, which happened August 1, 1605. He was interred at Eyworth in Bedfordshire. The printed works of this great lawyer, besides his “Readings,” which are still in manuscript, are, 1. “Reports of many principal Cases argued and adjudged in the time of queen Elizabeth, in the Common Bench,” London, 1664, folio. 2. “Resolutions a-nd Judgements on, the Cases and Matters agitated in all the courts of Westminster, in the latter end of the reign of queen Elizabeth,” | published by John Goldesborough, esq. prothonotary of the common pleas, London, 1653, 4to.